You see, with working 40+ hours a week, teaching zumba twice a week, going to other zumba classes, blogging, and just living a normal life, I tend to take shortcuts with my eats. Sometimes I only make things that can be quickly put together. But, tonight…tonight my friends, I took my time crafting a new salad creation! 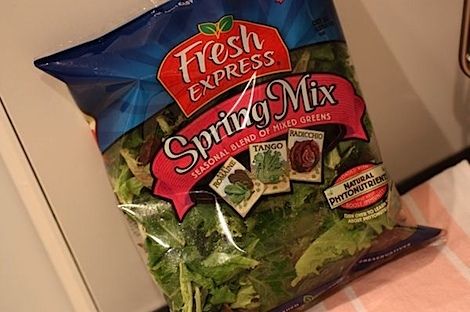 I recently received some coupons for free Fresh Express salad mixes as part of the Tastemaker Program with Foodbuzz, so I picked up some Spring Mix, which has a nice assortment of various greens. 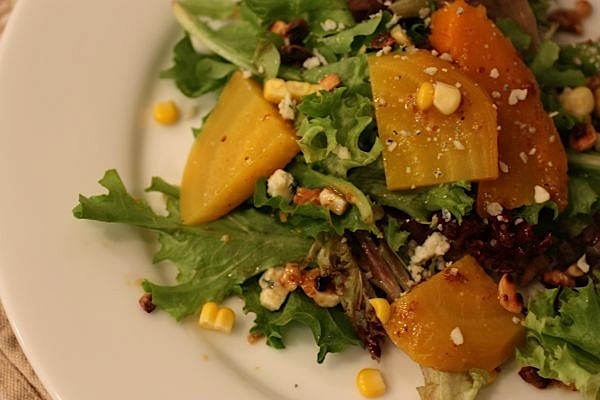 At first, I was inspired by the salad I recently had at Roy’s in Florida, and I planned on creating a salad with a roasted squash base (I was thinking perhaps acorn squash). I decided to use the squash as more of a presentation layer and let the other vegetables shine. 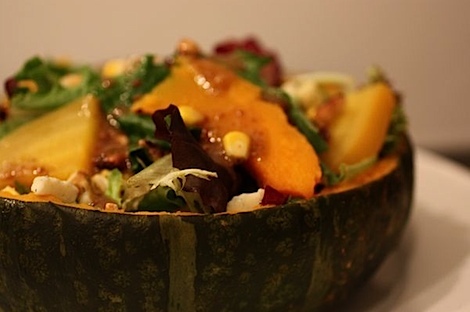 I went with kabocha instead of acorn because I thought it would fit more salad. I actually cut the corn from the base and peeled the beets by hand. I even made a from-scratch dressing based on a brainstorm I had the other night – Maple Dijon Vinaigrette. I ended up roasting the squash whole, then slicing it in half horizontally and scooping out the seeds and meat. I stored the squash inside for later, save a couple slices I added to the salad. The hardest part of the recipe was waiting patiently for the veggies to cook and then cool. But after that, it was simply a matter of assembly. One thing to note…I think the kabocha squash makes for a really nice presentation for if you’re entertaining guests. But, the squash bowl is totally optional. I think this recipe could be created on a regular week day without the squash bowl step. 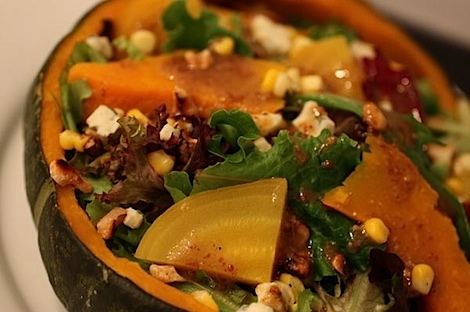 …and even looks pretty darn good without the kabocha bowl. 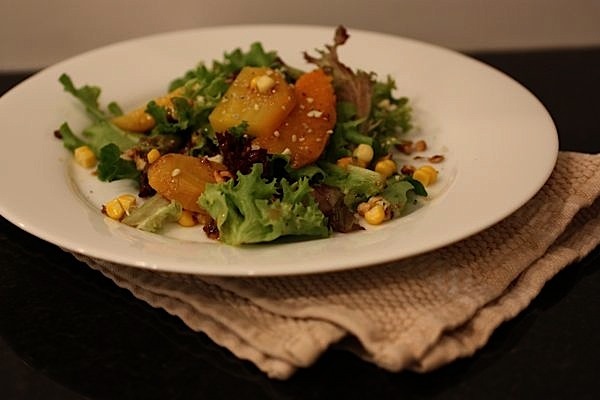 The combination of the sweet beets and sweet corn go really well with the Maple Dijon dressing, not to mention the gorgonzola cheese and toasted walnuts really add a lot of great texture and flavor. Don’t you just want to dig in? 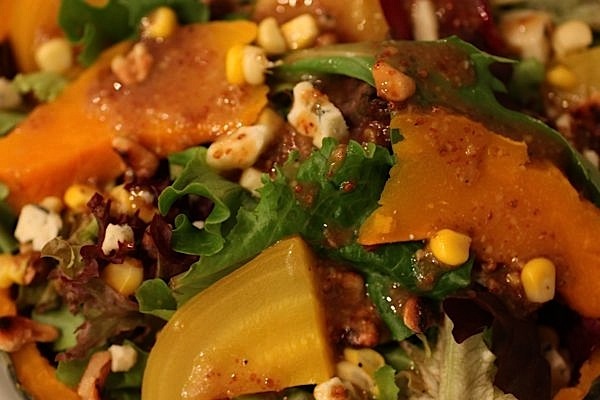 I present to you…Golden Autumn Salad, which is named for the colors in the golden ingredients, but also for golden fall days glowing with the gentle sun and colorful leaves. Pre-heat the oven to 375 degrees F. Prepare a baking sheet with parchment paper. Place beet on a sheet of aluminum foil. Drizzle with a bit of EVOO, sprinkle with salt and pepper, enclose in aluminum foil and place on prepared baking sheet and into the oven. Depending on the size of your beet, it will need to roast for 45-60 minutes, until a knife easily inserts into beet. NOTE: I cut my beet in half before roasting because it was HUGE! Leave small to medium beets whole. Optional step, if you’re using the kabocha squash: With 50-55 minutes left on the timer, add the kabocha to the baking sheet in the oven. Roast until squash is cooked through, or a knife easily inserts into the squash. NOTE: With differences in size of squash, yours may take shorter or longer to roast. It doesn’t have to finish at the same time as the other roasting vegetables. Meanwhile, carefully peel corn husk back from corn so you can remove the strings. 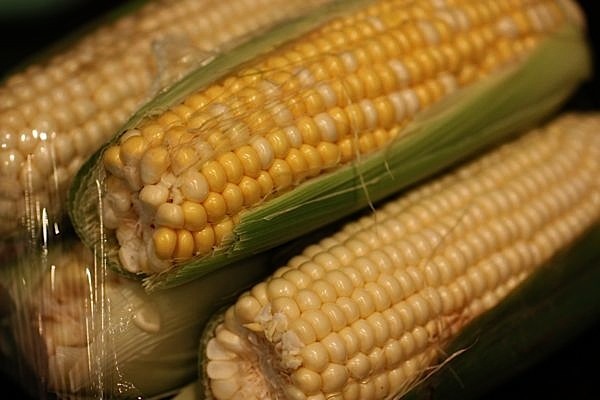 Drizzle corn with a bit of EVOO, sprinkle with salt and pepper and pull the husks back over the corn. Wrap the corn in aluminum foil. With 40 minutes left on the timer, add the corn to the baking sheet. NOTE: The corn, like the squash, also doesn’t have to be completely cooked at the same time as the other vegetables. Once vegetables are cooked, remove them from the oven and let them cool (I put mine, still in the packages, on trivets). 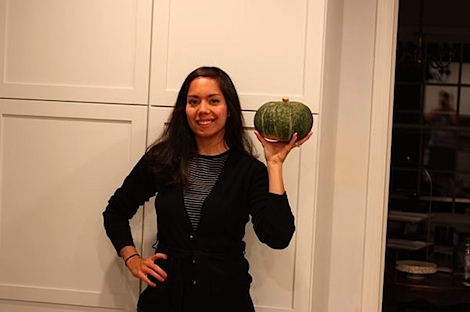 Optional step, if you’re using the kabocha squash: Once squash is cooled (mine was not cold, but at least cool enough to touch), cut the squash in half horizontally and scoop out the seeds and flesh. 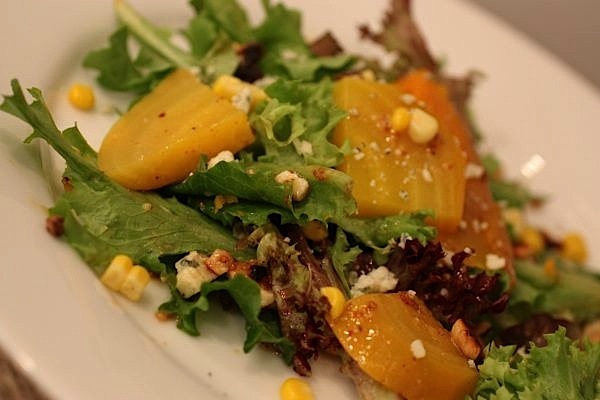 Set the flesh aside to eat later – you can even slice a couple wedges of roasted squash to add to the salad if you want. Once the corn is cool, remove the kernals from the base. Set aside. 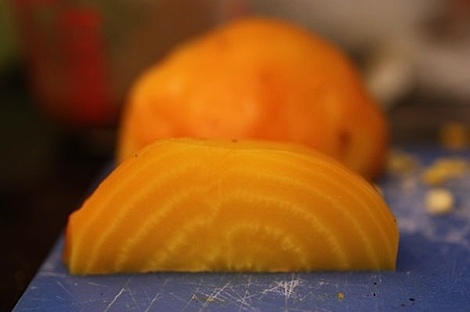 Once the beet is cool, cut into smaller pieces. Set aside. 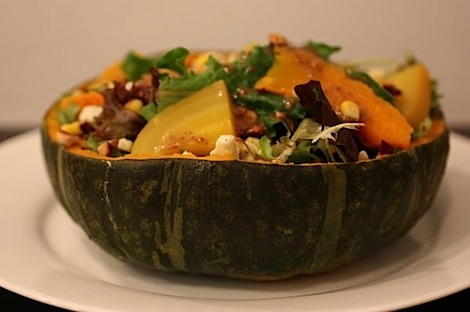 In the kabocha squash bowl (if you’re using it) or a large bowl, layer the salad mix on the bottom. Add beets, corn, optional squash, gorgonzola and walnuts on top. NOTE: You could also toss all the ingredients together before placing in the serving bowl. Drizzle with Maple Dijon dressing (recipe below) and enjoy. In a small bowl, whisk together all ingredients except the EVOO. 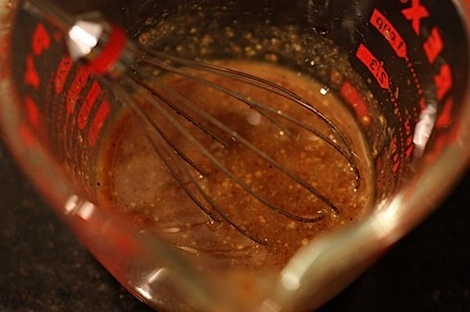 Slowly whisk in the EVOO to the dressing mixture till well-combined and emulsified. That looks delicious I will definitely be trying this. I made a spaghetti squash with spincash for dinner tonight as a side. It was the first time I have ever cooked squash so I was a bit disappointed by the recipe that mislead me into believing it would be ready in 20-30 minutes. I love the idea of using the squash as the bowl. This is gorgeous and looks DELICIOUS, Diana! That’s a great salad and I love the presentation. I LOVE this recipe!! Well, I really love eating anything out of a squash but I never though to actually put my salad in there. How clever!! Mmmm corn on the cob OFF the cob is one of my favorite foods. 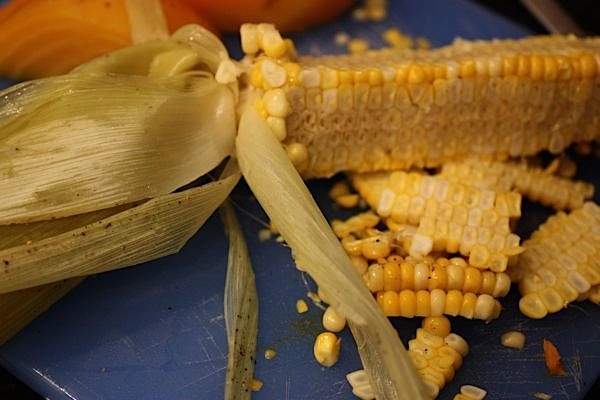 There’s something about cutting it off the cob and eating it that way that tastes SO much better—and reminds me of being a kid, when my parents would have to serve it to me that way because my teeth were so small! Oh, this looks lovely & so delish!!! Hey there, your salad looks tasty. FYI: it’s called kabocha squash. Kombucha is a fermented tea drink. 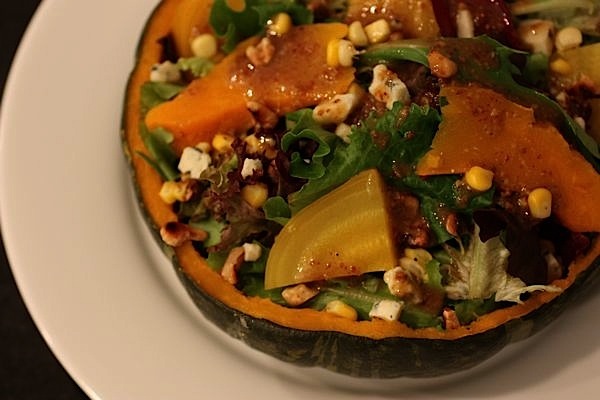 Love that you used a squash for a bowl – how pretty! 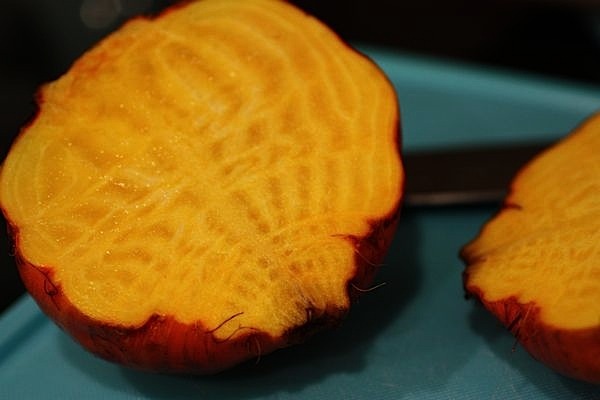 I have never had good luck with roasting beets – they never turn out right. I love em though.